Got talent? Check. Have ambition? Check. Need connections? Not if you're a Premium Member on OurStage. There's less than six degrees of separation between you and artists like John Mayer, Dixie Chicks, Alice in Chains Jeff Buckley, Beyoncé, Matisyahu, Franz Ferdinand, Nas, Lauren Hill, Cypress Hill and many, many more. 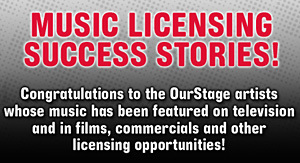 June's Artist Access Music Competition is giving rock, pop, country and urban Premium Members an opportunity to go behind the velvet ropes and meet with IMO president/ founder and former Sony Music and Columbia Records chief, Don Ienner. In the nearly forty years of working in the music industry, Ienner has helped further the careers of legends like Springsteen, Dylan, Leonard Cohen, Billy Joel, Pink Floyd and has guided the passage of talents mentioned above. You could be next. Upload an original song that best represents your music for your chance to earn an exclusive one-on-one with Don Ienner at his recording studio in NYC. The winner will be selected from within the Top 20 artists, as ranked by the music fans on OurStage. If chosen, you will have the opportunity to receive advice from an industry veteran whose insights may help you get closer to your dreams.